A large multi-center trial using four arms for 10 weeks is adding excitement and support for an adored herb—lavender. This is the largest trial of oral lavender supplementation ever conducted. The results are truly impressive. 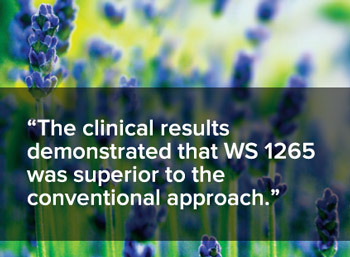 Lavela WS 1265 was evaluated at 160 mg and 80 mg against placebo and a conventional agent for promoting contentment. It appears the mechanism of action is inhibition of voltage dependent calcium channels (VOCCs).7 An interaction study showed that repeated WS 1265 administration at a dose of 160 mg per day has no clinically relevant inhibitory or inducing effects on several cytochrome P450 enzymes.8 Oral lavender appears quite safe. Of particular interest in the secondary findings of this study was tolerability in which adverse events in the lavender groups were similar to placebo (4.4% in the 160 mg group and 4.5% in the 80 mg group) and were primarily limited to mild gastrointestinal distress. In my practice, the same seems to be true. However, some of these effects are repeating of the oil the same effect fish oil can have but lavender oil tastes much better and is not offensive at all to some patients. Withdrawal from conventional and even some alternative approaches is a real concern. Discontinuation or reduction in dosages of conventional approaches should only be done by the appropriate practitioner. It does not appear that oral lavender has these same challenges. Lavender was only studied against one dosage of the conventional approach. This study relied on questionnaires which is a limitation but also accurately reflects common practices. You can see that there is a broad range of responses to each arm of this trial which is more a limitation of the evaluation techniques used and the type of subject recruited for the study. 1. Kasper S, Gastpar M, Müller WE, et al.Int J Neuropsychopharmacol. 2014 Jun;17(6):859-69. 2. Kasper S, Gastpar M, Müller WE, Volz HP, Möller HJ, Dienel A, Schläfke S. Int Clin Psychopharmacol. 2010 Sep;25(5):277-87. 3. Woelk H, Schläfke S. Phytomedicine. 2010 Feb;17(2):94-9. 4. Bielski RJ, Bose A, Chang CC. Ann Clin Psychiatry. 2005 Apr-Jun;17(2):65-9. 5. Allgulander C, Hartford J, Russell J, Ball S, Erickson J, Raskin J, Rynn M. Curr Med Res Opin. 2007 Jun;23(6):1245-52. 6. European Directorate for the Quality of Medicines and Healthcare (2005) Lavender oil. In: European Pharmacopoeia 5.0, p1894. Strasbourg, European Directorate for the Quality of Medicines & HealthCare. 8. Doroshyenko O, Rokitta D, Zadoyan G, Klement S, Schläfke S, Dienel A, Gramatté T, Lück H, Fuhr U. Drug Metab Dispos. 2013 May;41(5):987-93.